Contemplace is a spatial personality that redesigns itself dynamically according to its conversations with its visitors. Sometimes welcoming, sometimes shy, and sometimes hostile, contemplace's mood is apparent through a display of projected graphics, spatial sound, and physical motion. Contemplace is an environment in which inhabitation becomes a two-way dialogue. Spatial experience comprises several related elements. Some of these are ephemeral and difficult to isolate, such as time, context alongside adjacent spaces, and human presence or absence. However, some elements more directly affect spatial experience; in particular, sensory data such as visual changes, aural motion, and tactile input have profound impacts on the way we perceive space. Aperture focuses on the ways sound and light affect spatial perception. Multi-channel sonic textures, generated from recordings of existing spaces, encircle the space of the installation. 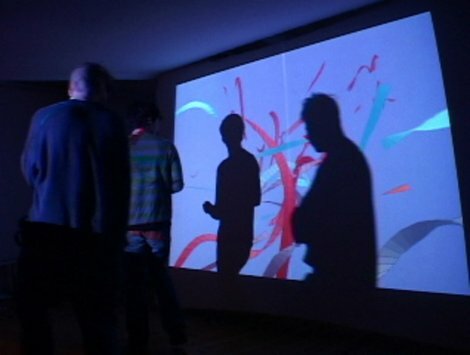 A rear-projected ceiling is used as a display and light source, describing arcs of motion, intensity, and color. Transitions between audiovisual textures echo transitional places in architecture, places that deal with changes in scale, use, material, and motion. By contextualizing these changes of sound and light in physical space, aperture enables visitors to gain a greater awareness of the composition of their individual perceptions of space.